For gun owners, Pew’s recent survey work belatedly agrees with the polls taken by ABC and Gallup, noting that around 42% of households report having at least one gun. The other firms score a bit higher. But Pew used to say that only 33% of households had guns. They changed their survey technique to ask the question twice, presumably in different ways, and they believe this explains the change. It is interesting nonetheless that there is now some general consensus, ignoring the chronic female underreporting of gun ownership (even this Pew poll shows a three-point response gap). The unsurprising result from Pew’s survey is that “Many American gun owners exist in a social context where gun ownership is the norm. 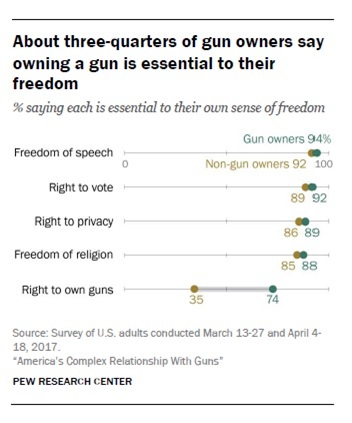 Roughly half of all gun owners (49%) say that all or most of their friends own guns. In stark contrast, among those who don’t own a gun, only one-in-ten say that all or most of their friends own guns.” Unsurprising, but it tends to prove the point pro-gun factions make: that the best way to win-over an anti-gun person is to take them to the range. Make them part of your circle of friends. A key problem lies in the perception of “gun rights” and education. Notice that in terms of most civil rights, gun owners and non-gun owners are closely aligned in their beliefs concerning freedom. They part company over guns, with non-gun owners not believing that gun rights are essential to their own sense of freedom. Of political note, 48% of Independents report owning, or living in a home with a gun. Independents are now the largest voting bloc in the country, outnumbering either Republicans or Democrats. Between this and the larger Republican gun owner base, I’m rather surprised that Democrat politicians would even mention gun control as it alienates nearly half of their swing votes. The most surprising insight from the Pew survey was that a mere 33% of gun owners like the idea of permitless concealed carry, a system which is rapidly expanding in the United States. As we noted in some preliminary research, permitless carry does not appear to change crime rates, so the reluctance of gun owners is perplexing. The second most surprising factoid is that a full 52% of non-gun owners “could see owning a gun in the future”. 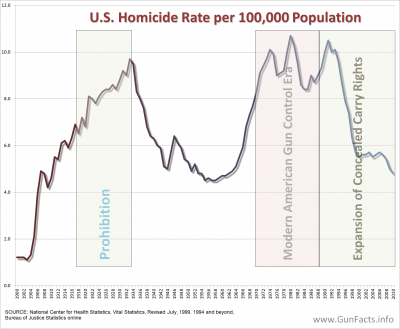 This appears to be largely skewed because many non-gun owners have owned guns in the past. These drop-outs explain the disconnection between gun ownership rates and support for gun owner rights. 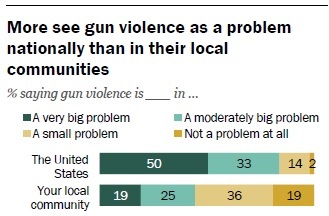 Pew confirmed media-influenced misperceptions about gun violence. As John Lott recently noted, most Americans live in counties where no homicides occur, with or without guns. But television news reports shootings where they do occur, broadcasting to the entire country. Entertainment media doesn’t help the misperceptions. As we noted long ago, 20 American cities have 21% of all homicides … and only 7% of the population. I could complain about Pew’s methodology, but I won’t (they use a panel who do “self-administered” web surveys each month, which has a self-selection bias, but they built their panel via random-digit dialing, and that improves survey reliability). That being said, Pew fumbled. Quoting their report “Respondents in the landline sample were selected by randomly asking for the youngest adult male or female who is now at home.” This is odd, and answering a question like “Are there guns in your home?” might lead to a miscounting, and on the low side. What is interesting though is that the initial contacts are made using both English and Spanish. Participants who have such weak English skills are more likely to not be citizens, and certainly not raised with American sensibilities toward constitutional issues, like gun owner rights. We covered this quite a bit in the blog post Polling Pollution, which showed why the gun ownership rate among Americans is not declining. One reason why I, a gun owner, believe permitless carry is a mistake is that in most cases, to gain a ccl one must take a course, including live fire qualifications. It seems to me to be a reasonable requirement that to carry a weapon one must demonstrate basic safety and use competencies. In North Carolina, you don’t need a permit to open carry. It makes no sense to make me pay for a right to concealed carry when I already have a right to open carry without a permit. As to permitless open carry, it’s my belief that there are three benefits to concealed carry. 1: Carry where businesses such as restaurants, malls, theatres, prohibit firearms. If I or any of my training partners had been at the Batman movie in Aurora, it wouldn’t have happened. 2: I believe the circumstances may be rare at best in which there is a tactical advantage to open carry in a rapidly evolving encounter. 3: I audit a CCW class every year just to keep my head in the conversation, and in every class the instructor emphasizes the preparations one should take for dealing with just the legal defense problems following a shooting. I might give some insight into why gun owners may be somewhat oppose permitless carry. Gun ownership has become “politically incorrect” in many parts of the country over the last 40 years. There may have been a decrease in gun ownership due to this, though it seems to be rising again. In this time, programs Like JROTC, school competitive rifle teams, hunting, and shooting sports have fallen off in popularity. As a result, far fewer people have any knowledge of firearms. As firearms became more politically incorrect, fewer parents talked to their children regarding gun safety, and far fewer took the time to engage their children in shooting fundamentals or shooting sports. This has now produced two generations of children, now adults, who have little or no knowledge of firearms. Many know nothing more of firearms than what see in entertainment media, hear in school, or from gun control advocates in the news media. Sadly, each of these sources are about equally fact based. The bottom line is, since firearms are no longer common knowledge, there is no “common sense” with firearms. Many of us who are gun owners have witnessed this first hand. The last thing anyone wants, least of all gun owners, is people carrying guns in the streets who have no common sense. The concealed carry permit accomplishes the same end that militia musters did in colonial, and post-colonial America. It ensures that everyone with a firearm knows how to use it safely and properly, and the rules of engagement, in this case the law regarding firearms. Unfortunately, I, and apparently many others believe this to now be a necessary evil.